Plane Performance Parts & Badges Are In! A long awaited plane customization update is here! 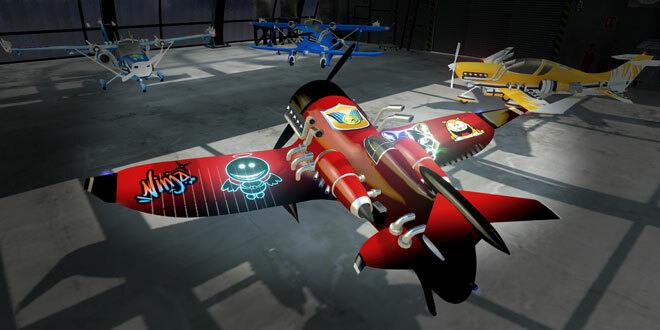 Play solo or multiplayer modes and collect plane parts: propellers, winglets, spikes, fins and many more. You can get parts for the plane you are using by collecting racing points – more racing points means more parts. Once you collect all parts for a plane you can start collecting different color sets: chrome, green, bronze and more. No plane part is an absolute winner, you will have to playtest and explore what’s the best combination of parts for you. Another big feature with this update is badges. You will see them on player profiles and you can also stick them on your plane. These are recognition badges given to players who are dedicated to playing more or are just simply great. In garage you can now rotate around your plane for closer inspection. Same goes for end of race showcase – check other people’s planes. Team colors were added to plane tails to recognize teams easier. Playing multiplayer brings bonus points +20%, winning team also gets extra points for races won. License plate in garage displays finger counting to show badge collecting progress. After 5 fingers are shown, you will earn a new badge. Garage got new menus: plane parts, skins, stickers, extras and badges. Visual improvements: chrome material on planes, night flying headlights and burning fire were redone. DirectX11 was crashing on some graphics card like Intel and some AMDs. It’s now fixed. Flying with arcade controls using mouse got easier. Now it doesn’t require constant dragging for long turns. Start collecting plane parts, bonus stickers and badges!